How to create a new Part TOC menu item that does a custom search? Hi Kalle, Reading your use case, it seems like this could be accomplished more easily with a SavedSearch. You can choose to display this SavedSearch from the TOC and share it with any number of users. You can do this by following the steps below. In the State column, type "Released"
Enter a label for this search, e.g. "Released Parts"
Enter the Identity to display this search for, e.g. "All Employees"
Do you know which project on Github ArasLabs this might be? Short note. In my solution, the search bar and page controls does not work yet. I tried to pass the page, pagesize and maxRecords via AML, but I am not able to click through the pages anyway. Any ideas? in an "onGet" server method. However, I haven't tested it that thoroughly yet though. Hi KalleAnka, many thanks for that! This seems to work really well, here are a few of my test results: Actions & Reports from the original Part ItemType can be reused, but must be linked manually in the new ItemType again. 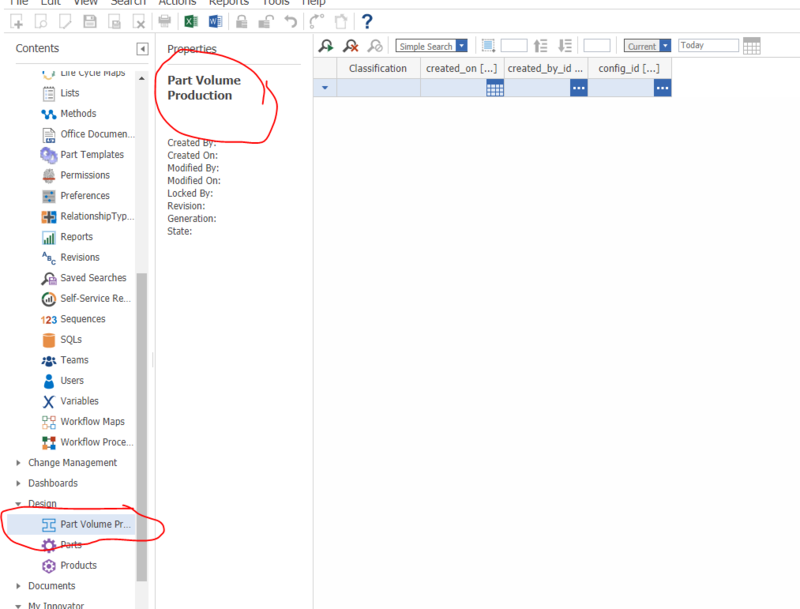 I do not think it´s possible to link the original Part Actions and Reports automatically. The only thing that makes some trouble is locking an item in the new ItemType. 1. Go to the new ItemType 2. Choose a Part 3. Click "Lock" -> Error message: Aras.Server.Core.ItemNotFoundException The error message points to the new ItemType and not to the original Part 4. Open a part and close it again 5. Now "Lock" works and references to Part So in my case "lock" works, but you have to open one Part first. The behavior stays that way until you log out. All other options like search bar and page controls work fine. Aha, that is weird! Would be neat if there was a more robust way to accomplish this. The following three also don´t work: - Save As - Where used - Structure browser All three link to the new ItemType and not to original Part. The behaviour makes sense. But especially "Save As" would be cool feature. In quite 90% of all cases our users use Save as to create a new Part. Right now the new ItemType is just a better version of SavedSearch. With "Save As" included it would become really powerful. Do you know, who gave the presentation about this topic? I was at ACE Europe 2016 but did not have time last year.